This post is not for those who are Google smacked. Please stay away or you will smack me for rubbing it in. However, I hope there are lessons to be learn from my mistakes. One of my blog (I shall not reveal which) which was Google smacked got PR 0. It was previously a PR 4/10. Then, I applied for reconsideration. And I got back not only my main URL pagerank of 4/10, I also got back all the internal pages pageranks. Many people still insist that pagerank does not matter in SERPs. It is not true. It has a lot of weight there. I have observed for a while and I am darn frustrated that no matter how, my position is always behind those who have PR 5/10. And those who have lesser PR tails behind my blog. There are certain keywords that I was tracking and the results always go by the pagerank. I am lucky that not many people has PR 5/10 (forget about 6/10 and above) in that blogging niche. I am also lucky that many of my internal pages have PR 3 to PR 1. 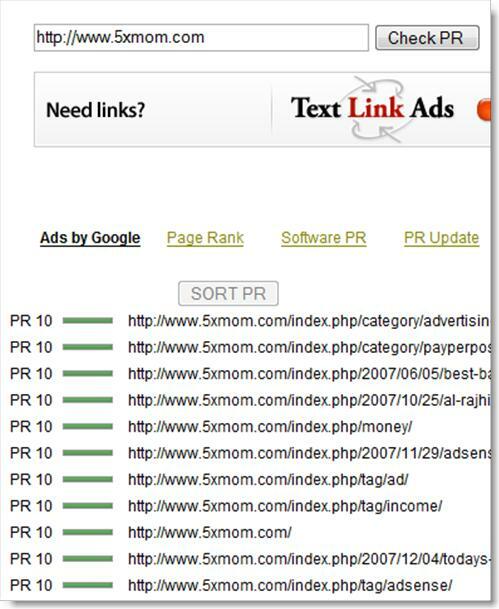 You can check your internal pages pagerank from Livepr. And a good tip is to improve, add tags, add keywords, make the title more relevant and edit those pages. Of course, use the SEO plugin for WordPress. Also if there are any useful keywords that you can link to your other pages, do it. Advertisers have to pay good money to get a link from us, so why not just take advantage of this for our own good? However, don’t stuffs too many links or Google may think you are a link farm. We may have 2,000 posts on one blog but sometimes, 20 pages are all we need to get the traffic. Here’s a screenshot from LivePr for this blog internal pageranks. Wakahkahkah….it says I have PR 10 on all pages. Who knows…it may be future PR prediction, eh? *announcing* It’s a perfect 10 for 5xmom! When I see the screenshort i was “WOW PR10″ and when I see ” System screwed up. :P ” Phew! getty cash – It was hilarious alright. Better than Google. Hahaha. LOL..that site has some bugs. It is giving PR 10 for any internal page of any site .. The LivePR internal PR checker is down most of the time. Does anyone know another way to check internal PR? Sometimes it also shows 0 to all pages. OMG ! PR10….lol. I wish i have also. I have found 0 so many and its better thank unranked. Back again….Did you got something from your mistakes man? But who can’t understand the importance of the inner pages PR, they are doing a mistake, they should change thier thinking if they really want to get something from this bussiness. its really nice and helpful, thanks buddy. I’ve just check with prchecker info for your site url thats only pr4. However, its good shared. Thanks. The Livepr tool was the first one I came across that allowed you to check the internal PR of all your pages. Like everyone on here has been saying though, it doesn’t work half the time and has a 60 minute time limit for each use. So, I decided to create my own site that offers a bunch of different SEO tools, including an internal PR checker.